St. Michael Catholic Church is located in west Houston very near to the Galleria. St. Michael is a parish community of 5,640 households and a 500 student school. The parishioners, clergy and staff of the parish/school strive to be faithful to the mission of Christ through its liturgical, educational and social service ministries. St. Michael Church offers two daily Masses and six on Sundays in our 1,200 seat church, as well as opportunities for reception of all other sacraments. The parish has programs in education and pastoral ministry for children, youth and adults as well as a vibrant social ministry outreach. The programs and services of the parish continue to grow. The school provides an excellent education in an intentionally Catholic environment. Each new parishioner adds a richness to our faith community which allows us to more fully reflect the Body of Christ in today&apos;s society. All Homilies and audio files that St. Michael has can be view through either Apple Podcast or Google Play Podcast. We will be adding more as the year goes bye, so you might want to subscribe and get updates on when we post new content. Click the icons below to be redirected towards Apple Podcast or Google Play Music. Most homilies will be posted on Mondays! If not you can listen with the player below! St. Michael the Archangel now has FORMED! 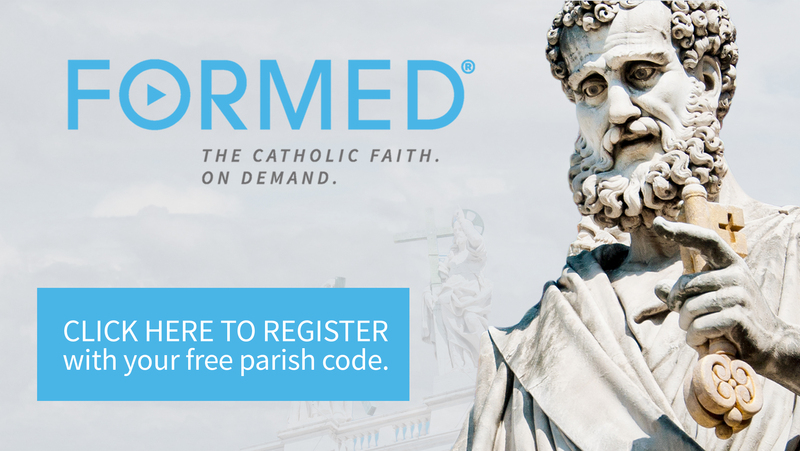 For those of you who would like to learn more about our beautiful Catholic faith, we’ve now got some great online resources available to every member of our parish through a new program called Formed. This online program includes a variety of free resources, including on-line books, movies, podcasts, and faith formation programs for people of all ages. In order to access these resources, just go to: formed.org and click on “Find Out More” at the bottom of the homepage. You will be taken to page where you can enter a parish code to get access to the resources. Our parish code is FPMPRM. You will be prompted to create a login for future use. After you submit this information, check out all the programs available for you to use from your home. Habitat for Humanity On Saturday April 27th and May 4th St. Michael will help with Habitat for Humanity from 8 AM- 3 PM and lunch will be included. Click here to sign up. Steubenville Lone Star On June 21-23rd, 2019 St. Michael will taking some High Schooler to Steubenville Lone Star! Open to current 8th-12th Graders. Click here to register. Easter Egg Hunt Easter Bunny is coming to St. Michael along with Easter Egg Hunt on Easter Sunday April 21st after 11am and 11:15am Mass. We hope you can join!